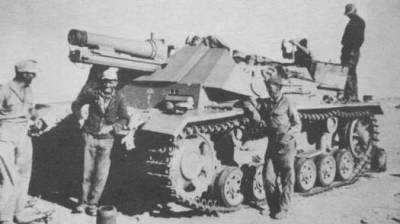 Notes The sIG33 Auf Fahrgestell Panzerkampfwagen II was developed to replace the successful but top heavy sIG33 (Sf) Auf Panzerkampfwagen I Ausf B. After trials using the chassis of a Panzer II, it was found that the length and width of the vehicle needed to be increased, so extra road wheels were added plus the extra width added to the hull. The engine had better cooling due to new hatches. This conversion caused delays in production but provided a vehicle with a low silhouette but had an open gun topped gun compartment. Only twelve were built and all were sent to North Africa to serve with the Afrika Korps and all were lost.